Scrutinized in new ways, the bodies and minds of women came to indicate how seriously they took their responsibilities in the fight for victory. A young American survivor of the Bataan Death March and brutal captivity, seeks revenge for the worst atrocity ever committed against the American fighting man. Historical fiction at its absolute best. CBI - China: Day 68 of 154 of the Japanese Invasion of Manchuria. Germany: An Animal Protection law is passed to "end animal cruelty." In twisted Nazi fashion, a hierarchical list puts Aryans, wolves, eagles and pigs at the top, with rats and Jews at the very bottom. Even the worst dictator needs as much support of the people as possible, at least in the early years, and passing this Animal Protection Act can actually be seen as a good thing Hitler did. The Nazi regime had elements which were very supportive of animal rights, wildlife and zoos and took several measures to ensure their protection. Today's animal welfare laws in Germany are modified versions of the laws introduced by the Nazis, who were also the first to protect endangered species, first labeling the wolf a protected animal. 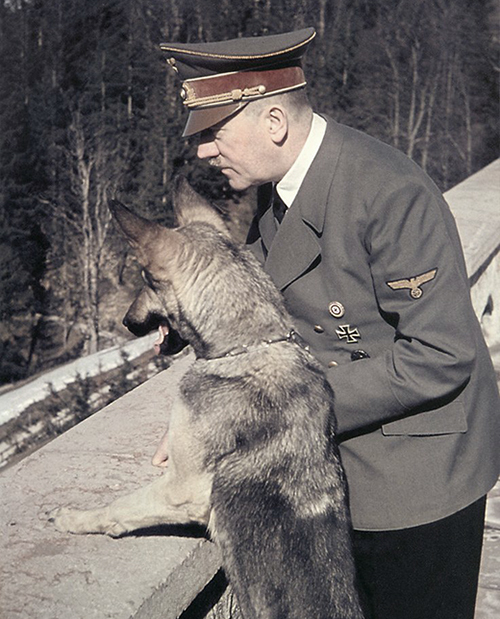 Although enacting various laws for animal protection and laws against vivisection, there was a lack of enforcement and many animal experiments took place during the Nazi regime. In twisted Nazi fashion, of course, animal protection was used as an instrument of Jewish persecution, first as a pretext to prosecute Jewish scientists. In 1940, a discussion was started within the Nazi administration about prohibiting pets in order to conserve foodstuffs for human consumption. But personal interference by Hitler stopped this proposal. Ultimately a decree was published by the administration against owning pets, but it referred only to the pets in the possession of non-Aryan citizens. On 15 Feb 42, a decree was published prohibiting Jews from keeping pets. By equating the Nazi Party with "nature," the Nazis reduced ethical issues to biological questions. 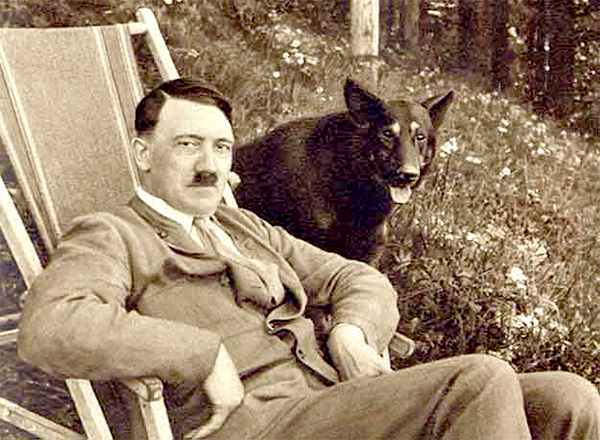 As a result, predatory animals were often honored along with their human counterparts (leaders and functionaries of the Nazi party) and opponents were identified as sheep destined to be killed. Before committing suicide on 30 Apr 45, Hitler ordered his doctor to test a cyanide capsule on his dog Blondi, and the animal died as a result. So much for animal rights. Germany: Nazis pass a law against Habitual and Dangerous Criminals, which allows beggars, the homeless, alcoholics and the unemployed to be sent to concentration camps. This law also allows for compulsory castration of "hereditary" criminals. Spain: Day 131 of 985 of the Spanish Civil War. Spain: Day 496 of 985 of the Spanish Civil War. CBI - China: Day 141 of 2,987 of the 2nd Sino-Japanese War. Day 104 of 106 of the 2nd Battle of Shanghai. Japanese troops land at Hangshow Bay near Shanghai. Spain: Day 861 of 985 of the Spanish Civil War. CBI - China: Day 506 of 2,987 of the 2nd Sino-Japanese War. Day 44 of 81 of Japan's Operation GUANGDONG. Atlantic: Germany warns all neutral shipping to stay clear of British and French coasts, or risk being sunk. CBI - China: Day 871 of 2,987 of the 2nd Sino-Japanese War. Day 10 of 381 of the Battle of South Guangxi. UK: Treasury cancels the bank holiday Boxing Day. ETO - UK: Day 80 of 258 of the Blitz. The Luftwaffe bombs Bristol. Eastern Europe: Slovakia's Prime Minister joins the Tripartite Pact in Berlin. East Africa: Day 168 of 537 of Italy's East African campaign in the lands south of Egypt. CBI - China: Day 1,237 of 2,987 of the 2nd Sino-Japanese War. Day 375 of 381 of the Battle of South Guangxi. CBI - Thailand: Day 55 of 221 of the Franco-Thai War (Vichy France vs Thailand). Czechoslovakia: Theresienstadt Ghetto is established near Prague. The Nazis will use it as a model ghetto for propaganda purposes. Russian Front - Finland: Day 156 of 164 of the Battle of Hanko. The Soviets will be forced off their leased naval base. Russian Front: Day 156 of 167 of Germany's Operation BARBAROSSA. Russian Front - North: Day 78 of 872 of the Siege of Leningrad. Russian Front - Center: Day 54 of 98 of the Battle of Moscow. Russian Front - South: Day 26 of 248 of the Siege of Sevastopol, Crimean Peninsula. MTO - Libya: Day 229 of 256 of the Siege of Tobruk. Rommel gives orders for his tanks to cut off the British supply routes by thrusting toward the Egyptian frontier, or as it becomes known, the "dash for the wire." East Africa: Day 533 of 537 of Italy's East African campaign in the lands south of Egypt. CBI - China: Day 1,602 of 2,987 of the 2nd Sino-Japanese War. PTO - US: US Army commanders across the Pacific are warned of the possible imminence of war. Russian Front - North: Day 443 of 872 of the Siege of Leningrad. Russian Front - North: Day 6 of 59 of the Battle of Velikiye Luki, near Leningrad. This stalemate does help ease the siege a little, but mostly it keeps German troops from being sent to other fronts. Russian Front - North: Day 204 of 658 of the Siege of the Kholm Pocket, USSR lays siege to the Kholm Pocket but the Germans hold out for a about a year and a half. Russian Front - Center: Day 1 of 21 of the Battle of Sychevka, Russia. Russian Front - South: Day 150 of 150 of Germany's CASE BLUE, the failed offensive to take the Caucasus oil fields. Hitler calls off this offensive in order to concentrate on Stalingrad. Russian Front - South: Day 95 of 165 of the Battle of Stalingrad, bloodiest battle in human history. MTO: Vichy President Laval sets up Phalange Africaine to fight Allies in Africa. MTO - Tunisia: Day 8 of 178 of the Battle of Tunisia. US 9th and 12th Air Forces provide air support. MTO - Libya: US 9th and 12th Air Forces provide air support. CBI - China: Day 1,967 of 2,987 of the 2nd Sino-Japanese War. PTO - Alaska: Day 171 of 435 of the Battle of Kiska, Aleutian Islands. The US and Canada will defeat the Japanese invaders. PTO - Malaya: Day 279 of 357 of the Battle of Timor Island, a long guerrilla war ending in Japanese victory. PTO - New Guinea: Day 6 of 66 of the Battle of Buna-Gona. PTO - Solomon Islands: Day 110 of 187 of the Battle of Guadalcanal. ETO - Germany: Day 7 of 135 of the Battle of Berlin (RAF bombing campaign). Berlin reports a "sea of flames" this morning with casualty estimates put at between 8-10,000 killed. Russian Front - North: Day 808 of 872 of the Siege of Leningrad. Russian Front - North: Day 569 of 658 of the Siege of the Kholm Pocket. USSR lays siege to the Kholm Pocket but the Germans hold out for a about a year and a half. Russian Front - South: Day 93 of 122 of the Battle of the Lower Dnieper River, USSR. MTO - Italy: The British 8th Army advances into the Fossacesia area. The US and Royal Air Forces provides air support. MTO: US 15th Air Force heavy bombers attack the submarine base at Toulon, France, while others strike the marshalling yard at Sofia, Bulgaria. CBI - China: Day 2,332 of 2,987 of the 2nd Sino-Japanese War. Day 23 of 49 of the Battle of West Changde. PTO - Gilbert Islands: Day 5 of 5 of the Battle of Makin. The Japanese end their resistance efforts on Makin. PTO - New Guinea: Day 67 of 219 of the Battle of Shaggy Ridge. PTO - New Guinea: Day 64 of 162 of the Battle of the Huon Peninsula. PTO - Solomon Islands: Day 24 of 295 of the Battle of the Bougainville Islands. ETO - France: Day 116 of 284 of the Battle of Brittany. ETO - France: Day 71 of 236 of the Siege of Dunkirk. ETO: The Allies cross the Saar near the Franco-German border. French 1st Army captures Muhlhausen in Alsace, while the French 2nd Armoured Division takes Strasbourg. ETO - Germany: Day 67 of 145 of the Battle of Hürtgen Forest. ETO - Germany: US 8th Air Force B-17s and P-51s attack the Norstern benzol manufacturing plant near Gelsenkirchen and the marshalling yard at Duisburg. ETO - Germany: Himmler orders the destruction of the crematories at Auschwitz. Russian Front - Finland: Day 71 of 223 of the Lapland War. Finland and Russia have joined forces to kick the Germans out of Finland's most northern province. Russian Front - Center: Day 41 of 206 of the Battle of the Courland Pocket in Latvia. Russian Front - Center: Day 34 of 99 of the Siege of Memel, a border town of Lithuania and East Prussia. Russian Front - Center: Day 72 of 72 of the Battle into East Prussia and northern Poland. The Soviets have cleared the Baltic section. Russian Front - South: Day 27 of 108 of the Battle of Budapest, Hungary. Russian Front - South: Day 72 of 72 of the Battle of Belgrade, Yugoslavia. Results in a Soviet victory. MTO - Italy: US and Royal Air Forces provides air support for the Allied ground units. CBI - Burma: Day 238 of 302 of the Chinese Salween Offensive. CBI - Burma: Day 11 of 31 of the Battle of Bhamo. CBI - China: Day 2,698 of 2,987 of the 2nd Sino-Japanese War. Day 222 of 259 of Japan's Operation ICHI-GO. PTO - Japan: US B-29s bomb the Nakajima aircraft factory near Tokyo. PTO - New Guinea: Day 333 of 597 of the Battle of New Britain. PTO - New Guinea: Day 217 of 481 of the Battle of Western New Guinea. PTO - Palau Islands: Day 71 of 74 of the Battle of Peleliu (Operation STALEMATE II). PTO - Philippines: Day 36 of 299 of the 2nd Battle of the Philippines, aka the Liberation of the Philippines or the Philippines Campaign. PTO - Philippines: Day 36 of 73 of the Battle of Leyte. PTO - Philippines: Day 14 of 41 of the Naval Battle of Ormoc Bay. A dog's natural intelligence, physical abilities, and pure loyalty contribute more to our military efforts than ever before. A general overview of Canada's contribution to the Second World War and of the war's effect on Canada's evolution. A film that serves as a wake up call and an alarm to our youth of today who don't have a clue to how they awaken to each new day in a land of unimaginable freedoms.